Locarus operates in the professional market for monitoring and tracking equipment manufacture and distribution. The company was founded in Russia in 2006 under the corporate name of “Black Box”. 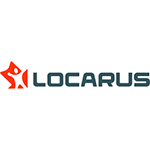 Locarus started with satellite monitoring systems to grant their clients control over transport and workforce. Since then the company extended its activities to offer certain supplementary devices from third-party manufacturers to provide solutions for any local or general GPS-tracking issues. The chart below shows the changes within the last 30 days in the number units of Locarus devices type are connected to Wialon Data Center.